Autism, commonly referred to as Autism Spectrum Disorder (ASD), is a developmental disability that can cause a range of mild to severe social, communication, and behavioral challenges. Approximately 3.5 million people in the U.S. have autism. One of the datasets that the U.S. Centers for Disease Control and Prevention (CDC) collects puts autism prevalence among eight-year old Americans at 1 in 59, while the other CDC dataset puts autism prevalence at 1 in 36 American children. Health economists at the University of California-Davis estimated the total cost of caring for all people with autism in the United States, to include ASD-related medical, nonmedical, and productivity losses in 2015. They reported that this annual cost was $268 billion, and that it will rise to $461 billion in 2025. Further, they stated that if autism prevalence continues to increase at similar rates, costs could reach $1 trillion by 2025. The National Institute of Health (NIH) houses the Interagency Autism Collaborating Committee (IACC). 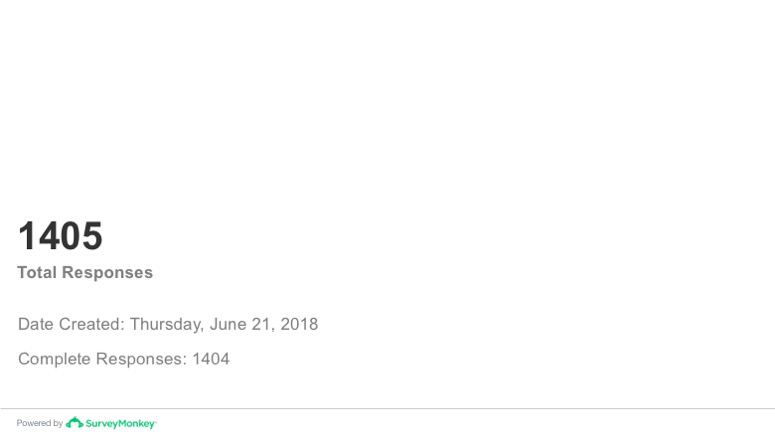 The IACC, as created by the Children’s Health Act of 2000, is responsible for developing and annually updating a strategic plan with budgetary recommendations for autism research, and for monitoring ASD research across Federal agencies. The Autism Collaboration, Accountability, Research, Education, and Support Act of 2014 (Autism CARES Act) reauthorized the IACC, and expanded its role. The IACC is now also responsible for including a focus on supports and services in its annual strategic plan, and for increasing its research monitoring responsibilities to include services and support activities. Twenty years after the IACC was created, autism prevalence has increased by over 120 percent, and the IACC’s work has not identified any new causes of or treatments for autism, despite billions spent on Federal autism research. 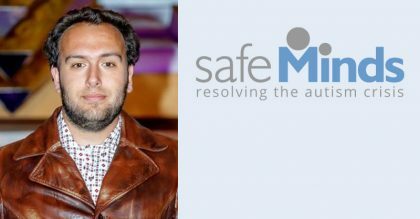 In the Summer of 2018, the leaders of three national autism nonprofit organizations–SafeMinds, Talk About Curing Autism (TACA), and The Thinking Mom’s Revolution (TMR)—surveyed the autism community on its satisfaction with the IACC’s responsiveness, accountability, and effectiveness after they asked to speak with Dr. Ann Wagner, the Federal autism coordinator, about the 20 percent increase in autism prevalence in just two years. 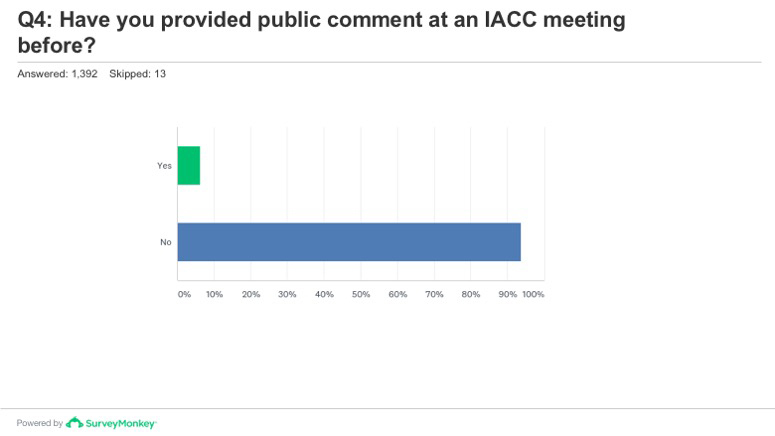 Dr. Wagner instead referred the groups to provide public comment at the next IACC meeting, which would take place six months after they made their request to meet with her. 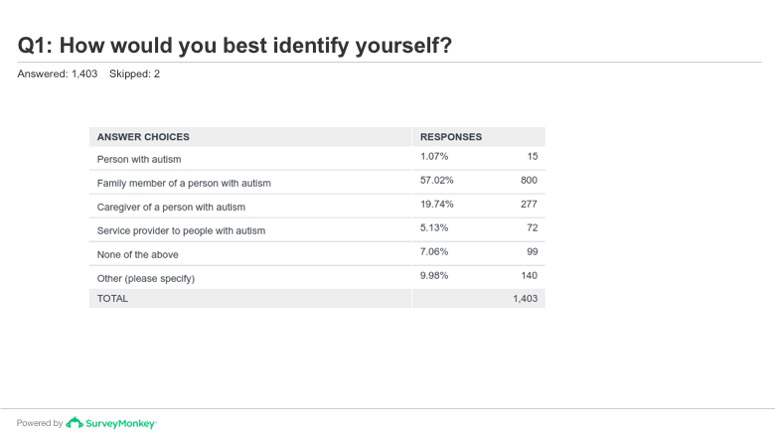 To clarify the problems that autism community stakeholders have with the IACC for the Federal autism coordinator, SafeMinds, TACA, and TMR designed and implemented a 15-question, multiple choice survey instrument, the “2018 IACC Stakeholder Satisfaction Survey.” The survey also provided respondents the opportunity to provide text answers choices as an option. 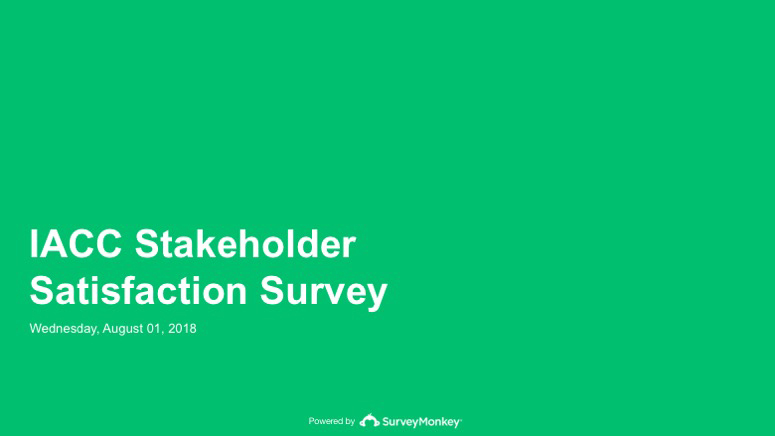 Results of the IACC 2018 Stakeholder Satisfaction Survey were collected via SurveyMonkey from 1,405 respondents online, over a two-week period in the Summer of 2018. 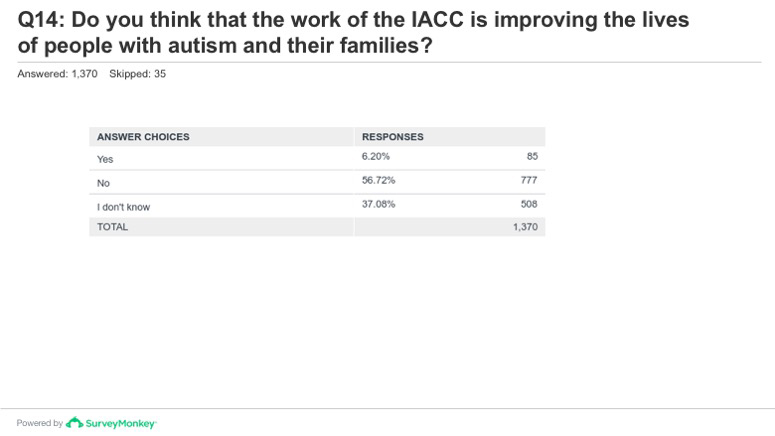 • Almost half of the survey respondents in the autism community were unaware the IACC existed. 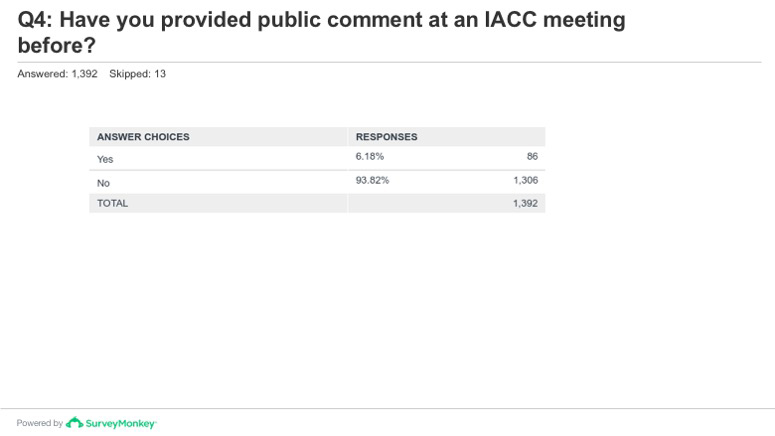 Of those who were aware the IACC existed, the majority felt that the IACC had not addressed their issues. 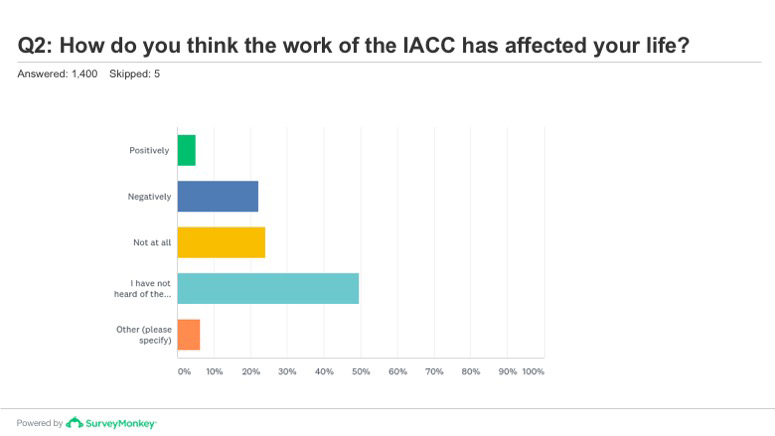 • Over 46 percent of 1,400 respondents reported that the work of the IACC has affected their life either “not at all” (24 percent) or “negatively” (22.21 percent) while 49.5 percent had not heard of the IACC until they completed the survey. 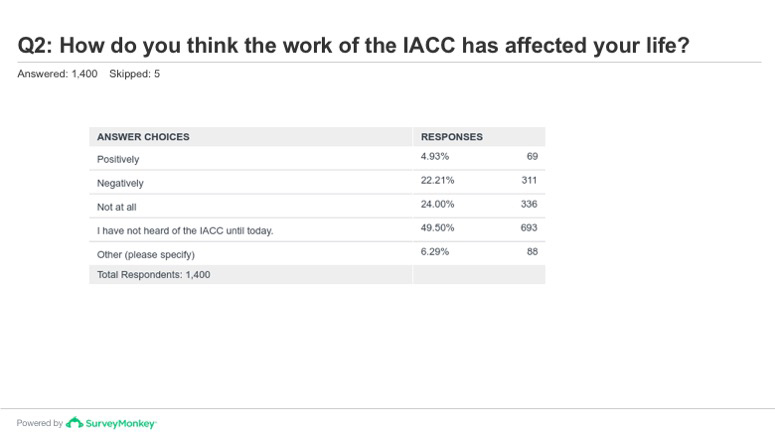 Only 4.93 percent stated that the work of the IACC has affected their lives positively. 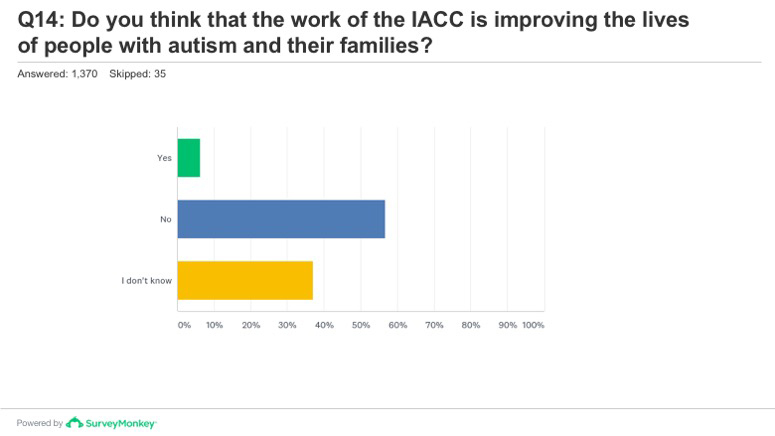 • Over 56 percent of 1,370 respondents said that the work of the IACC is not improving the lives of people with autism and their families, while 38.08 percent stated that they did not know if it was. 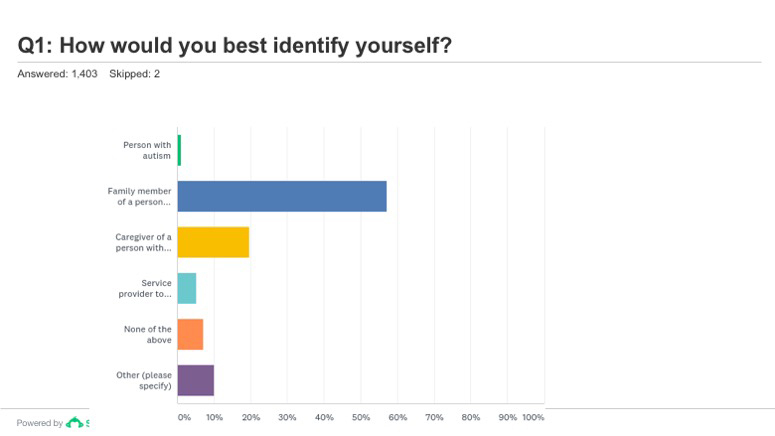 Only 6.2 percent stated that it is improving the lives of these stakeholders. 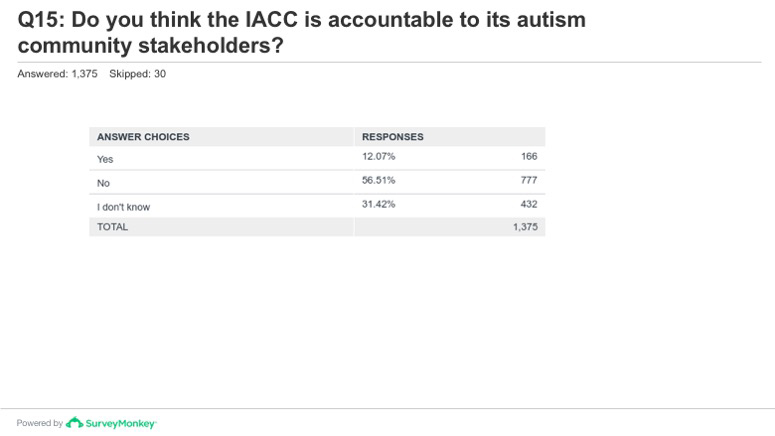 • When asked if they think the IACC is accountable to its autism community stakeholders, 56.51 percent of the 1,375 respondents reported that they did not. 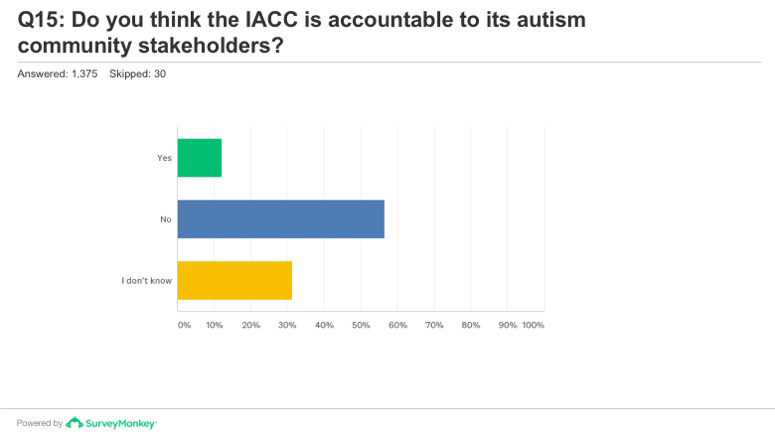 While 31.42 percent stated they didn’t know if the IACC is accountable to its autism community stakeholders, only 12 percent answered in the affirmative. The autism crisis demands a more urgent, accountable, effective, and transparent response than what the Federal Government currently provides. The crisis is characterized by a lack of supports, services, research-based medical treatments, environmental causation research, caregiver support, and clinical practices, among other insufficiencies. 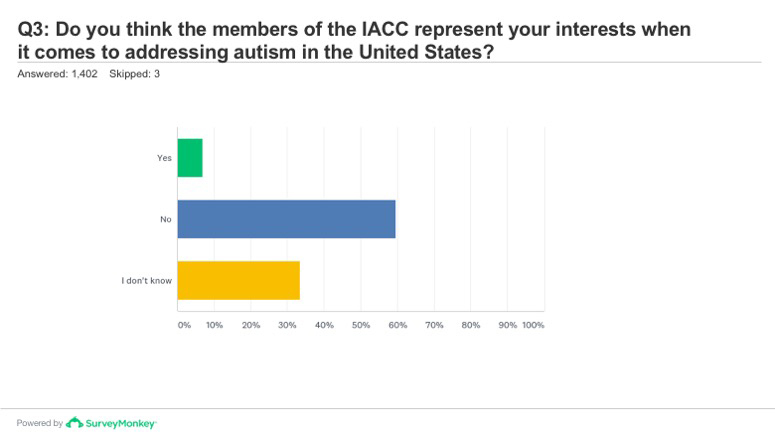 1) Replace the IACC with a full-time Federal autism coordinator, who will lead a small Office of National Autism Policy Coordination in the agency-neutral Executive Office of the President. 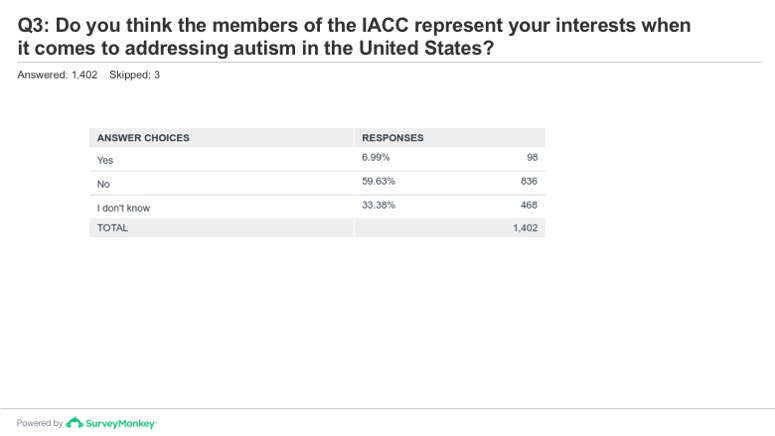 Spending nearly $1,400,000 per year to operate the IACC, whose work does not affect the majority of Americans with autism living today, is not an appropriate use of taxpayer funding. The Federal Government should consider new government structures to create a more inclusive, proactive, and accountable Federal response to the autism crisis. 2) Establish an annual National Autism Strategy, coordinated by the new ONAPC, with measurable goals, objectives, and outcomes presented annually to Congress and the President. 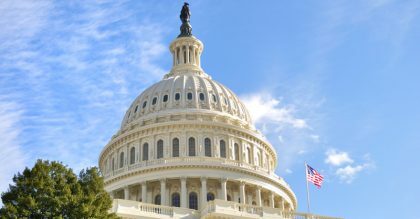 The Federal autism coordinator should lead a listening tour across the country, and the ONAPC can coordinate focus groups in different U.S. locations as it formulates the National Autism Strategy. The Strategy should be data-driven, with a scientifically-sound autism “census” that quantifies the number of children and adults living with autism, and research-based policies and programs. 3) Mandate the use interactive technology to encourage and increase stakeholder participation in Federal autism policy and research development, implementation, and evaluation. 4) Prioritize research that will affect clinical outcomes so that it becomes more relevant to people living with autism and their caregivers. 5) Monitor the effectiveness of Federally-funded programs and coordination among agencies that focus on autism. These activities are critical for effective resource allocation management, program evaluation, and maximizing American taxpayers’ return on investment.